If you haven’t watched Melvyn Bragg’s brilliant historical documentary, The Most Dangerous Man in Tudor England, on BBC iPlayer, then don’t miss out – it’s available here. Bragg tells the story of William Tyndale, the man who gave his life, literally, to seeing the Bible translated into English. It’s gripping and well shot, from Tyndale’s childhood in Gloucestershire countryside to his extended period of exile in Antwerp. And it’s a stirring film for those who treasure the Bible as God’s word. When we watched it we couldn’t help but reflect on just how often we take the Bible in our own language for granted. And yet what a cause to give your life to! Tyndale’s famous and admirable aim was that even the “ploughboy” might be able to understand the Word of God for himself, rather than simply those who knew Latin. 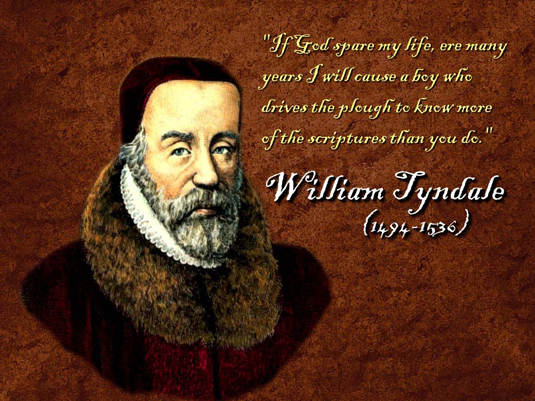 That was because Tyndale believed the Bible to be nothing less than God making himself known. And contained within the Bible’s big storyline was nothing less than the good news of Jesus Christ. Through Jesus, God has come to rescue people, to bring people to God. For Tyndale nothing could be more relevant, more precious, more pressing. And Bragg’s trademark historical ‘roughness’ means he isn’t afraid to pull any punches in representing Tyndale’s vitriol against Roman Catholicism and the way it “shut out” people from the Bible. If that whets your appetite and you fancy hearing a bit more on Tyndale, with a more explicitly edifying edge, then have a listen to John Piper’s audio biography talk here. Alternatively, if you want a moving twenty-first century example of receiving the Bible in your native tongue for the first time, watch the video below. It brings home the reality that nearly five hundred years after Tyndale, there’s still around 514 million who do not have any portion of Scripture in their language. And for those of us who are privileged to have the Bible in our own language already, I suppose Tyndale’s life and death challenges us to ask whether we hold the Bible’s with the same value that he did. I’ve listened to the BBc programme by Melvyn Bragg on William Tyndale. What a dramatic, powerful and moving story. Thank you for sharing it. I’ve recently read a good book on Tyndale. It’s called the Book of Fire by Brian Moynahan and it’s about Tyndale and More and their impassioned clash. It really brought home to me just how much we take being able to have the Bible to hand, in our own languages, for granted and what a joy it is to be able to study it for ourselves and talk about it openly with one another. Really powerful thought about so many people still not having that joy.